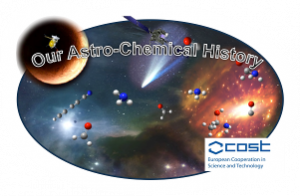 The school is co-organized by the COST actions CM1401 “Our Astrochemical History” and CM1405 “MOLIM: Molecules in Motion”. A large variety of chemical compounds, from hydrides to complex organic species, is observed in star and planet forming regions. These complex species are also detected in present-day comets and meteorites, possibly as witnesses of the early stages of Solar System formation. An active chemistry proceeds in the harsh environments of pre-stellar cores and proto-planetary disks, where UV photons or X-rays irradiate cold diluted gases and ices, and radicals are copiously produced. The aim of this Action is to bring together laboratory and theoretical gas phase and surface chemistry as well as large facilities based experiments with the aim of rationalizing the molecular evolution. Specific markers, such as isotopic fractionation, ices composition, and abundance ratios of isomers, must be used and understood, in order to draw a coherent picture of our chemical origins. Succeeding former European initiatives that shaped the field of Astrochemistry, this Action focuses on the molecular evolution towards higher complexity. Being a stepping-stone for building models, the Action would deliver new schemes for physical chemistry at large, like chemistry of transient species and photochemistry, in gas or on surfaces. Interpretation of sophisticated experiments often requires advanced theories. A consistent set of user-friendly tools for an elaborate treatment of nuclear motions of microscopic and macroscopic systems does not yet exist. Development of the armoury of first-principles nuclear motion theory, via the advancement of theories, algorithms, and codes, is the major goal of this Action, with special emphasis on quantum effects involving electrons as well as nuclei. Molecular scientists, modellers and engineers will all benefit from the new methods and codes. The developments cover quantum chemical, quantum dynamical, semi-classical, and advanced classical treatments. Access to most of the source codes developed within the Action is provided to the scientific community free of charge. Multifaceted collaborative efforts with experimentalists applying the pilot versions of the new tools is considered to be vital to the success of the Action. MOLIM is a platform for (a) development of an extensive, heavily interlinked collaboration network of theorists and experimentalists from more than 20 countries; (b) quick dissemination of important results to a large and growing scientific community; and (c) establishment of long-lasting EU-wide conferences and training schools, educating the next generation of users of the next generation of chemistry tools. Copyright © 2019 Training School All Rights Reserved.